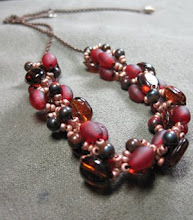 Back in June I ordered a kit for the second "Use the Muse" beading competition and the big reveal of the "muse" just happened over at The Beader's Muse. There are some amazing pieces in the galleries over there and I'm really glad I did this. It was fun putting together something based around a large focal piece. That's not the way I usually design things I'm working on but I'm trying to get better at it. I'm pretty happy with how the piece I made turned out and if you've seen me lately it is very likely I've been wearing it. 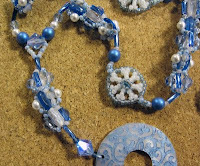 It's entitled "Clouds of Blue" and is the first piece of jewelry I've made that I've ever had to name. I'm still trying to decide how I feel about that. I experimented with making some of the seed bead circles I've used in the past three dimensional and I was really excited by how they came out. I think they'll work really well in earrings in the future.